Well one more gig tonight and that’s my Hammer and Tongue tour done and dusted. It’s been an amazing couple of weeks, hard work and filled with the usual worries and paranoias of touring around and performing to new people in new places, but it’s been totally worth it and so, so much fun. I’m writing this in a coffee shop in Southampton. I can’t remember ever going to Southampton before, and after a while all these towns start to look the same, or at least, their high streets and shopping precincts. This morning I was in Reading, yesterday, Oxford. They all have Waterstones and Wetherspoons and most of them have still got HMVs. Travelodges and Ibises. This morning in Reading I was walking to the station and I saw someone going around giving free henna tattoos to the homeless. I’m not sure what this achieves, and whether or not it helps the plight of those who are on the streets, but it’s something I applaud. I also saw a sign for a chiropodist which offers a walk in service. And on the train to Southampton I heard the gentleman behind me as the young lady with the coffee trolley of the train was anywhere near Bristol, yet. No, she replied. I had a great gig in Oxford last night. There was a remarkable moment where I did a countdown to the beginning of a poem and right on cue, at the exact moment, a police siren blared outside. The audience thought it was hilarious. And what a remarkable audience it was, too. They were definitely up for a laugh and they seemed to like my own brand of whimsy. Steve Larkin is an amazing performer who certainly knows how to warm up an audience and I really enjoyed his set, filled with humour and energy, and I could easily have watched it for longer had I not been performs immediately after him. One of the good things about this tour has been the chance to perform a lot, and to use this as an opportunity to try out new material. I have incorporated a couple of new poems into my sets this last week or so, one of which has been getting huge laughs every night and will be immediately promoted to the main set that I usually take around with me. Indeed, I’ve been doing the same basic set for the last three years, and I’m looking forward changing it, adapting it, playing around with the format and the content, and incorporating lots of new material, but this is something which I’ll start work on once I’m back in Devon this weekend. So that’s the tour almost done and dusted, then. And I’ve met such wonderful people on the way. I’ll have to remind myself that life won’t always be like this! Well, I got to the gig, and it was the best one of the tour. The audience was totally amazing and definitely up for a laugh, I so wish that I’d recorded my set! There was a remarkable energy in the room and it was one of those gigs where two thirds of the way through my set I thought, well, this is one of my best ever gigs. I know that they’re not always like this and that it’s probably lulled me into a false sense of security, but last night when I came off the stage, soaked in sweat and totally knackered, I thought, well, I can conquer the world! It’s a feeling which dies off, of course. There was much I could have done to make my set better. But wow, what an end to the tour! One of my highlights of last year was performing my show, In the Glare of the Neon Yak. It was a show which took me away from my comfort zone, a sustained piece, occasionally theatrical, humorous, but with moments of introspection and tenderness. On one of the hottest days of the year, I was privileged enough to be able to perform it at the GlasDenbury Festival, on the poetry stage in a marquee, with the hot sun beating down. And me wearing a feather boa and one hundred percent polyester ringmaster outfit! Due to the presence of kids at the festival, i had to do a slightly edited, clean version of the show, but it was still received well and remains one of my favourite moments of the year. In the Glare of the Neon Yak is a riproaring piece of spoken word storytelling set on a sleeper service in the middle of winter. A train full of circus performers are being stalked by a mysterious entity which seems to mean more than just its eerie manifestation. A portent, an omen, the Neon Yak symbolises dark times. Will our hero find love? Will Jacques, the tight rope walker, get back together again with his ex, the circus clown? Does the secret of the Neon Yak lie in the hands of a randy old lady? Has the buffet car run out of sausage rolls? Will Tony the Train Manager find where they’ve put Carriage F? 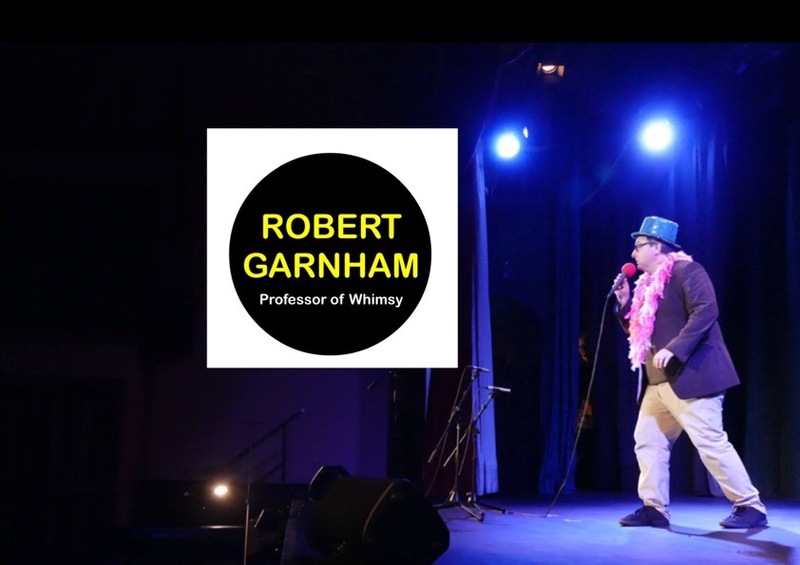 An hour show combining poetry, storytelling and music, In the Glare of the Neon Yak is the sparkling new show from spoken word artist, Robert Garnham. I’m Robert Garnham, Professor of whimsy. Professor of whimsy. That’s not my nickname, that’s just what I call myself. For marketing purposes. If you’ve made it up yourself, it’s not a nickname. That’s the rule. A nickname isn’t a nickname if it’s something you’ve decided without anyone else’s input. A friend of mine is a semi professional darts player, and he’s decided to call himself The Intimidator. Just like that. He has decided. Keith The Intimidator Hepplethwaite. The only thing intimidating about Keith is his liberal use of Lynx Africa body spray and his ability to belch the theme tune to Frasier. It’s pretty disgusting. So he calls himself The Intimidator, and at great expense he has had it printed on his shirt across his shoulders, The Intimidator, and on his darts, The Intimidator, and on his personalised beer mug, The Intimidator, and he insists that everyone call him The Intimidator. Look at me, I’m The Intimidator. The Intimidator! And then one day, as a joke, I called him Doris. And you know what? Now EVERYONE calls him Doris! But there’s something weird going on with the names of the people in his darts team. The members of his darts team are Matt, Pete, Trev, Jim, Kev, Deano, Craigie and Paulie. So apparently, this is the rule. If you’ve got a name of two syllables or more, your name is shortened to the first syllable. So Matthew becomes Matt, Trevor becomes Trev, Kevin becomes Kev. Fair enough. If you’ve got a one syllable name to start with, then an extra syllable is added on the end, as they’ve done with Deano and Craigie. Ok, then. But the team was recently rocked by an crisis when a new member joined them. And this crisis was because his name was Milo. What the hell can they do with the name Milo? It’s already got an O on the end, and you can’t shorten it to Mile, that’s too much of a mouthful in the fast paced world of pub darts. So what they’ve done is really quite ingenious. Cos they’re quite sneaky really, are darts players. Sneaky little darts players! They’ve stopped calling him Milo, and they’ve started calling him Fido, which kind of sounds like Milo, and once they’d got used to calling him Fido instead of Milo, they shortened it to Fide. Like rhinos line astern gripping tungsten spears. Beer belly a-quiver overhanging too wide tee shirt unsolicited stomach glimpse darts. Spherical hysterical measures out in trebles. Cocky oche-jockeys crafty cockneys dressing sloppy. Sports-upholding team mate-scolding beer glass-holding. Carpet shuffling fart-muffling comes away with nothing. Forefinger fling-flourish free-form darts throw panache. Board-seeker tip bounce wire hitting kerplink. Great big belly-man darts-land Leviathan takes a stand. Last game, the same again, self-same blame game. In the team lean, seeming so keen, trophy a gleam, he’s a darts machine! No pain no gain, no gain, no fame, oh, the shame! Writ large straight into the exact centre of the board! Author Robert GarnhamPosted on March 8, 2019 Categories art, comedy, performance, poem, poet, poetryTags 180, art, comedy, culture, darts, edinburgh, fringe, fun, funny, humour, lgbt, literature, performance, performance poetry, poem, poems, poet, poetry, Robert Garnham, spoken word, theatre, writingLeave a comment on On nicknames and darts.